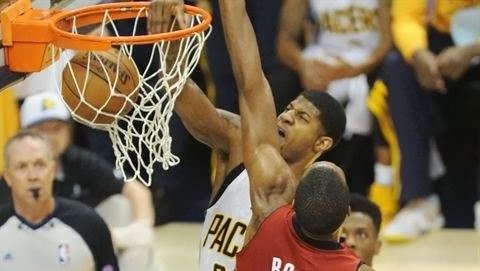 As an Indianapolis native and current resident, I have to Congratulate the Pacers on their Eastern Conference Finals Game 6 win (91-77) and for successfully tying up the series 3-3! Now it all comes down to Game 7, which will be played Monday, in Miami! 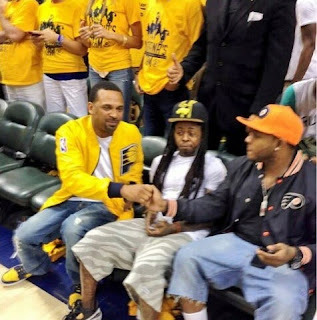 Check out the images above and take notice that Lil Wayne was in the Bankers Fieldhouse (Indianapolis) to watch the game last night. Shown here with Mike Epps and another gentleman. I hope that Weezy wasn't too disappointed for the Heat lost. May the best team win in Game 7.